Will L Brands Cut Its 9% Dividend Yield? The Victoria’s Secret parent company could be a classic dividend trap. Shares of L Brands (NYSE:LB) tumbled to a multi-year low after the apparel retailer reported its second quarter earnings. Its revenue rose 8% annually to $2.98 billion, marking the company's fourth straight quarter of positive sales growth. Total comparable store sales rose 3% as 10% growth at Bath & Body Works offset a 1% decline at Victoria's Secret. But on a store-only basis, which excludes direct-to-consumer (DTC) channels, L Brands' comps slid 1%, with a 5% decline at Victoria's Secret overwhelming 7% growth at Bath & Body Works. L Brands' top line growth looks stable, but heavier promotions reduced its gross margin from 37.3% a year ago to 35.5%, while its operating margin slid from 10.9% to 7.6%. On the bottom line, the company's net income fell 29% to $99 million, or $0.36 per share. L Brands also offered soft earnings guidance for the rest of the year. For the third quarter, it expects earnings of $0.00 to $0.05 per share, compared to earnings of $0.30 a year earlier. For the full year, it slashed its EPS guidance from $2.70-$3.00 to $2.45-$2.70, which implies a 20% decline at the midpoint. Analysts had expected a 13% drop. However, L Brands now pays a whopping forward yield of 8.7%. That big dividend, along with the stock's forward P/E of 10, make it look like a tempting investment for income investors. Will L Brands' dividend set a floor under the stock, or will the divident be cut as the retailer fails to revive its core businesses? How sustainable is L Brands' dividend? L Brands pays a quarterly dividend of $0.60 per share, but it hasn't raised that payout in over two years. However, it often pays special dividends -- including $1.00 per share dividends in 2013 and 2014, and $2.00 per share dividends in 2015 and 2016. Over the past 12 months L Brands spent 57% of its earnings on its dividend. However, L Brands' full-year earnings guidance of $2.45 to $2.70 per share would barely cover its $2.40 in annual dividend payments and eliminates the possibility of a special dividend this year. For comparison, L Brands' rival American Eagle Outfitters (NYSE:AEO) spent just 41% of its earnings and 39% of its FCF on its dividends over the past 12 months. However, AEO pays a lower forward yield of 1.9%, and is expected to post double-digit earnings growth this year. 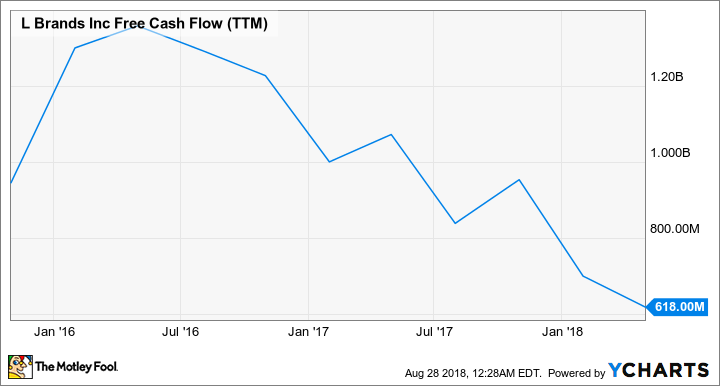 L Brands also spent over 100% of its free cash flow (FCF) on its dividend over the past year. The company's bleak earnings outlook indicates that ratio will remain high as its FCF -- which has been sliding over the past two years -- dries up. During the conference call, CFO Stuart Burgdoerfer said that he remained "comfortable with the dividend today" and expected stronger holiday quarter sales to support its high yield. Burgdoerfer also claimed that improving earnings would boost the company's stock price and get its yield back to a "more normal range." However, L Brands faces a tough uphill battle to grow its sales again, especially at Victoria's Secret and its younger banner, PINK. Victoria's Secret's DTC sales rose 22% annually last quarter to $360 million, but that only accounted for 12% of L Brands' top line and failed to offset its sluggish brick-and-mortar sales. Both brands face fierce competition from rivals like American Eagle Outfitters' Aerie, which posted high double-digit comps growth over the past several years. Aerie branded itself as the "anti-Victoria's Secret" by hiring models of all shapes and sizes, using untouched photos in ads, and launching social media campaigns that promoted realistic beauty standards with its #AerieReal hashtag. AEO's Aerie. Image source: Aerie. PINK was supposed to help Victoria's Secret counter Aerie. However, the brand's declining comps and the announcement that PINK CEO Denise Landman would retire at the end of the year don't bode well for the brand's future. Jefferies analyst Randal Konik recently warned that PINK's sales could be cut in half and cause L Brands to cut its quarterly dividend. L Brands probably won't cut its dividend this year, but its strategy of using discounts to drive sales could result in some nasty earnings declines over the next few quarters. Those declines will weigh down its stock, and probably cancel out any dividend gains.